Flexible Cable - NFPA79 conforming UL Listed highly flexible cable. The RMFEV(CL3) is a listed cable that offers the high flexibility of the RMFEV series while conforming to the NFPA79 standard. It uses 80-micron extra-fine wire for the internal conductors, and hard fluororesin (ETFE) insulation for high durability and low friction drag between insulated cores. 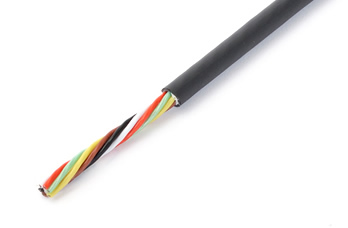 The cable features high mechanical strength, heat resistance, and high flexibility. The cable’s sheath uses PVC for excellent flame retardancy, oil resistance, and flexibility. Shielded types are also available for protection against electrical interference.